Liberals didn’t blink an eye when Virginia Gov. Ralph Northam endorsed a proposed law that would extend so-called late-term abortion to mean the mother can decide after the child is born whether it lives or dies. Killing babies hours after they are born, that didn’t shock party leaders. Then, a photo taken more than 30 years ago was dug up from the governor’s college yearbook of a man in blackface with another dressed in a Ku Klux Klan hood. Now, the party is in an uproar. It’s okay today to want laws that kill a child after it’s born and call it abortion. It’s not okay to have been a racist in college. It’s for the latter that former Gov. 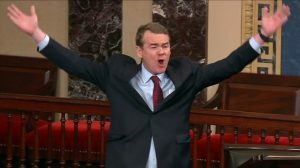 John Hickenlooper and U.S. Sen. Michael Bennet are demanding the Virginia governor resign, along with the rest of the party elders. We find the photo disgraceful and do not defend it. But even more reprehensible are the actions of our own Colorado leaders, who had no quarrel and stood by silently last week when the Virginian endorsed infanticide. But racist behavior 30 years ago? Well, off with his head.